Include: Del - Cochin return airfare economy , Accommodation in 3 star hotel , Daily Breakfast, All transfers & Sightseeing by Aircondition vehicle. Pick up from Cochin Railway station/Airport. Proceed to Munnar and check in to hotel. Over night stay at Munnar. Morning breakfast at hotel later sightseeing of Munnar, visiting Tea Plantations, Mattupatty Dam, Boating, Echo-Point, Kundala Lake, Top Station, Rajamallay and return to Munnar. Over night stay at hotel. After breakfast Proceed to Thekkady. On the way, You can see Cardamom & Pepper Plantations. Over night at Thekkady. After breakfast check out from the hotel and proceed to Kumarakom and check in to your resort. Overnight stay at Houseboat. 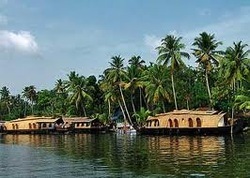 After breakfast, check out from Houseboat and drop at Cochin Railway Station / Airport.